A partnership between a San Diego real estate firm and the largest nonprofit solar installer in the U.S. is gearing up for the launch of a program that could help cut housing costs for local veterans and active service families, and provide job training in the booming solar industry. Operation: Solar for San Diego Troops, which will kick off on Thursday, July 9th and run through Veterans Day, November 11th, is a unique way for us to give back to our troops (and their families) who have served the country, as the program aims to supply 15 homes with clean, renewable solar energy, along with job training scholarships for at least 5 veterans. Four of the homes that will receive solar arrays will be ones that are through the veterans program of Habitat for Humanity, which helps families build affordable homes for themselves. If you’ve been in the military, or have friends or family who are either in active service or are veterans, then you know that it’s not a career known for being well-paid, and although pay and benefits are provided, many servicemen and women struggle financially both during and after their service. Cutting down on the amount of money that has to get spent on utilities each month is one of the advantages of a rooftop solar array, so installing solar systems onto these veterans’ homes is a great way of serving those who served their country, by reducing their monthly housing costs. GRID Alternatives, the nation’s largest solar nonprofit, has partnered with the Willis Allen real estate firm, which is located in San Diego, to bring this ‘solar for veterans’ program to life. Agents with Willis Allen Real Estate are donating time for both fundraising and volunteer efforts, and the firm has seeded the project’s fundraising initiative with a $30,000 grant. As part of the Operation: Solar for San Diego Troops, volunteers are needed to help with the solar installation, which will not only present an opportunity to give back to veterans, but will also give hands-on experience in an industry that is poised to grow exponentially over the next few years. Those interested in volunteering can submit their interest at Grid Alternatives, and monetary donations are also being accepted toward the estimated $150,000 project costs. A fundraising campaign for this project has been set up at Fundly, where donors can choose to support the project at any level they desire, as well as share the campaign with others who may be interested in giving back to veterans in this way. In addition, individuals can nominate a veteran who would benefit from Operation: Solar for San Diego Troops by sending their name and brief story to: operationsolar@gridalternatives.org. GRID Alternatives, with the mission of making renewable energy technology and training available to underserved communities, has been behind the installation of more than 5,400 solar rooftops (totaling more than 18.5MW in solar capacity), and provided solar job training for some 21,000 people. 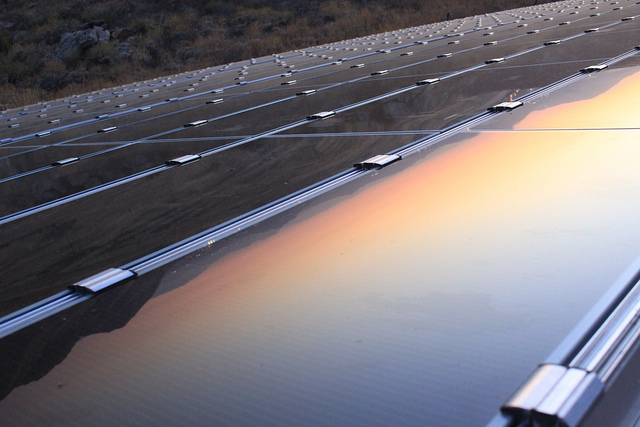 Funding for these efforts comes from private donors, cap-and-trade revenue, and companies in the solar industry. Find out how you can join the rooftop solar revolution!